More jobs and better wages, especially for the lowest paid, would be welcome outcomes, given that there are 714,000 Australians presently unable to find suitable work and a further 1 million Australians looking to increase their hours of work in order to improve their family lot. Unfortunately the Treasurer, Scott Morrison, is not able to share with us any economic modelling to demonstrate how this round of corporate tax cuts will assist. He has urged that we use 'the pub test'. The government concedes, 'Inequality has risen across the developed world in recent decades, driven in large part by strong growth in wages for high skilled jobs, and slower growth in wages for low-skilled jobs.' But it continues to boast that a job, even if low paid, is the best path to beating inequality. "No doubt the electorate in time will have its say on whether the present government's economic recipe is the correct one for increasing jobs and growth, and for arresting inequality." While the rich who can order their affairs through corporate arrangements get tax cuts, the poor who work shifts are losing their penalty rates and they are being unsupported by the government in claims for a substantially higher minimum wage. Of course, it is always a contest between the major political parties to convince the public that they have the balance right in the run-off between capital and labour and that they have the pressure right, encouraging individuals to join the job market while regrettably leaving others to receive less than adequate welfare assistance. The politicians' economic advisers will no doubt tell them how far they need to go in addressing the budget deficit and in priming the pump for jobs and growth. But any prescription needs to comply with a basic level of equity and sustainability. We Australians have moved a long way from the days when both sides of politics accepted: first, that every Australian worker should be paid a living wage sufficient for an average family to survive; and second, that every Australian is entitled to a basic level of welfare assistance when unable to work. Families and work patterns are now more diverse than in the past: we must be more responsive to the positions of couple parent and sole parent families who are unable to provide a decent standard of living for their children because of low wages and part time, irregular and insecure employment. We need more coordinated policies to ensure that minimum wage rates, taxation policies and welfare payments provide every worker with a fair wage and guarantee every family what is needed for a decent standard of living. We also need more direct measures to stimulate and protect employment rather than the reliance on theoretical trickle down policies. In an age of 'budget repair', social policy risks becoming just a sidebar to economic policy which is a contest of ideas about how best to grow the size of the pie thereby providing a slice for 'the deserving poor' without having to redistribute too much of the pie, while 'the undeserving poor' drop off the edge as they would have anyway. For those of us schooled in Catholic social teaching, the so-called 'undeserving poor' are the litmus test of our commitment to the human dignity of all persons. We believe human dignity is innate; it is not acquired by displaying socially attractive attributes like employability. There is declining public trust in our major political parties which used be the primary spaces for negotiating and effecting the compromises necessary in the Australian democracy which is committed to the right balance between the popular will and the recognition of the due rights and entitlements of all citizens. These compromises are now rushed through back room deals with the growing Senate cross bench with its plurality of philosophies, or at least a variety of self-interested claims. When the government finalised the corporate tax cuts in the Senate last month, the last group of crossbenchers to the table were Senator Nick Xenophon and his team. They made their agreement contingent on the government's concession on a raft of energy measures including a one-off payment for aged pensioners, disability pensioners and recipients of parenting payments to help them with their escalating electricity bills. A single recipient will receive a $75 payment and couples will receive $125. Senator Xenophon thought this one-off payment would see these pensioners through to 1 July 2018 when changes to the National Electricity Market rules would 'bring everything to a head in order to ensure that there are lower prices for our electricity and security of supply'. After 1 July 2018, I daresay, those pensioners and parents will be left to ponder the trickle down effect of the tax breaks given to the top end of town while their power bills continue to go through the roof. They will be left confused as to how Senate horse-trading can deliver equitable, sustainable results for all Australians when the pub test on jobs and growth is clouded by a shattered hope that electricity prices would magically fall. If you want to see a great example of the effectiveness of 'trickle-down' economics in an unregulated economy, visit India. Take a tour to a magnificent palace, then ask the driver to do a drive-by of the nearest rubbish dump to see the ragged, disease-ridden children who live on them picking through the garbage every day. Frank good to see you now have a CEO after your name. Looking forward to future writings on CSSA topics. Crikey, Frank! CEO of CSSA. You have one hell of a job in front of you - Good luck! "the rich get rich and the poor get poorer" The writer of that song was not seduced by the empty promise of trickle down economics. The fact is everything (insurance, rates, power, etc.) goes up except our ability to pay for it and all this political blather will do nothing to improve the situation. Privatisation of public services has much to answer for. I have been saying quietly for a long time that the last time trickle down worked was when there was a generous lord in the Manor - read palace the size of Melbourne CBD. A recent trip to England confirmed my view. The worst example I saw was a gift to the monarch from the local Lions club. Perhaps the trickle up affect has been aroiund longer than we thought? Frank, One cannot help being sceptical that Pope Francis should lecture the "faithful" via Evangelii Gaudium about the dangers inherent in the trickle down effect. The assets of the Holy See and the Vatican Bank exceed the assets of the 5 wealthiest corporations in the USA (in which they hold significant holdings). Its akin to being lectured by the Queen in her annual address on how to treat the poor. Does she even know or care that 400 people sleep in cardboard boxes every night under the Embankment Railway Station? Then she climbs wearily Into her new million dollar Bentley and hastens back to one of her many palaces. In truth the only substance that trickles down from both religious institutions is the effluent from their affluent sewers. Bernie is right. The cuts will only help the shareholders. In the meantime over 700,000 Australians struggle to make ends meet. And our country is strangled with red tape and questionable priorities - like righting the wrongs in Syria, Afghanistan and Iraq when they cant even get it right here, Manus or Nauru. Thank you Frank for stating the current state of affairs. Maybe I'm a dreamer but I thought political leadership brought together intelligent people to serve the interests of all in Australia. That minimum wages have fallen is not news. Why they have fallen is of greater significance. We are told that high wages in Australia have seen businesses close down or shift their operations off-shore. We have witnessed automation cause a loss of some jobs - think the supermarket checkouts for example. Other than wring their hands, bemoan the loss of the car industry, and use the awarding of contracts to build our navy's ships for political purposes (keep SA onside) our Federal politicians appear to have no plans to meet the challenges to the economy posed by globalisation and technology. As for compassion for the unemployed and a "living wage": these concepts belong to a proud past when Australia led the world with its award wages, a Conciliation and Arbitration Commission, Trade and Labour Councils, adjustment of awards according to annual shifts in the cost of living etc. The politics of "every man for himself" are coming home to roost. We either develop a caring inclusive society or a selfish divisive one. I am yet to be convinced of this government's capability to do the former since their policies appear only to promote the latter. 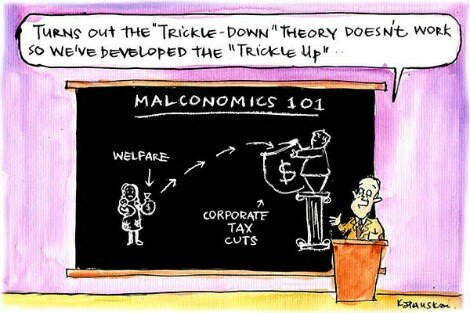 Having read the article on "Trickle Down" I was amused on recalling an economics teacher at UNE in the 70's saying that.... "Most trickles evaporate before they go anywhere". I recently wrote to senator Deb O'Neill to say that she and the Labour Party should reaffirm their opposition these trickle down theories. The Labour Party got it right the 1st time. They should stick to their guns. With interest rates poised to rise I can see where some of the trickle might go - back to the banks to help with the bottom line. Meanwhile the struggling family burdened with massive borrowings for housing, will only see their costs increasing. Crikey Frank! How about CSS employ some people with first hand experience of the issues afflicting the people they are trying to help? How about looking at the "trickle down" in Jesuit politics. FR Brennan, are you honestly saying that an HIV positive gay man would be judged on his merits as a teacher in a Catholic school or university and there's be not "trickled down" down morality applied? Trickle down is not an economic theory but more an assertion, not supported by evidence. Sanmarco, I'm sure if that gay man could prove he was celibate/abstinant (as I'm sure heterosexual unmarried staff are) and had contracted HIV by accident in a unscreened blood transfusion - he'd be welcomed with open arms. I want our country and all countries to be guided by humanitarian principles and not economic speculative theories that are contingent upon maintaining inequalities. Actually, Julie Davies, a much better example of a more radically deregulated economy than India is Hong Kong, 1950s to 1990s. Laissez-faire Hong Kong passed Australia in per capita GDP in the early 1990s, without a hugely disparate Gini coefficient, as far as I can tell. India might be on the way, but Hong Kong holds the torch. If "trickle down" economics is just laissez-faire capitalism, then isn't the history of Hong Kong a very uncomfortable fact for you anti-trickle-downers? Feel free to supply evidence otherwise. Name one economist who has articulated the so called 'trickle down' effect. Once we had a right to keep as much of what we earned because it was ours. Today it seems that governments graciously allow us to keep a % which they, in their wisdom, think we can manage.